Is technology killing school? Should it? I don’t know if you can clearly see the panoramic view of my office below (thanks iPhone – I love your panorama feature!) in this post. I’ve only put it here to point up a reality that many people like me are now living. On my left behind me (as I type) are shelves and shelves of books. In front of me is the large screen you see in the picture and the computer which is attached to it on my right. I live, in other words, somewhere between the old and the new; between an old world of paper, and a new digital world of the internet, computers (going, going…?) and various handheld devices – and let’s not even mention, yet, the fanciful Google glass idea. Others are going faster than me. Pearson (my publisher) for example is going hell-for-leather into digital publishing (I suppose that should be hell-for-digital) with consequences that I do not believe they can quantify or be sure of (though in principle I support their intentions); visionaries like Sugata Mitra have gone a lot further – and he and that ‘further’ is the subject of this post. Sugata Mitra, you will remember, gained fame with his hole-in-the-wall experiment in which computers were installed literally in a hole in the wall, first of a Delhi slum, and then in a wall in a village in India and kids were left to get on with it. The results were, apparently, astonishing. With no ‘teaching’ as such, the kids soon worked out how to use the computer, download anti-virus software and all manner of other computer abilities. By themselves! If you want to watch Mitra himself talking about it (after winning a HUGE cash prize for his work) you can see his TED talk here. Mitra’s idea is that that the concept of schools has had its day. He says: I’m not saying they’re (= schools) broken. It’s quite fashionable to say that the education system’s broken. It’s not broken. It’s wonderfully constructed. It’s just that we don’t need it anymore. It’s outdated, and he goes on to suggest that we need to create ‘self-organised’ learning, in SOLEs (self-organised learning environments) where people gather round computers (or use handheld devices), sometimes with the help of a remote ‘granny’ asking them ‘yes but how are you doing this?’ etc. So no more school, then, just kids solving problems (like how DNA works – and they did this in a foreign language in one experiment he describes, though with little real detail) together, because they can do this, and don’t need it done to them. A utopia, in other words, where children are simply set together to work things out for themselves. Because we don’t NEED to have good handwriting or be able to do multiplication (all those things that outdated schools taught); we don’t need to KNOW anything any more, only to be able to work things out collaboratively, by ourselves and with ourselves. Sounds a bit Lord of the Flies? Perhaps. Because despite the immense popular appeal and reputation that Sugata Mitra has evoked, many are not convinced. Donald Clark, for example, questions the way the hole-in-the-wall experiment was funded (by a computer company); suggests that in using mentors (and having computers in schools) all these SOLES are just schools in disguise and worries that giving an anecdote-driven ‘inspirational’ TED talk (where the audience pays up to $10,00) is not the same as producing qualitative research. He (Donald Clark) thinks that only low-level learning takes place (something Mitra implicitly denies in his TED talk), and most damningly accuses Mitra of the very colonialism that he (Mitra) credits with having invented the school system in the first place [my own take? Schools are and were a lot older and more diverse than the British empire. Education has been around a lot longer than that, and in different contexts]. In a startling piece by a soon-to-be TED lecturer herself, Audrey Waters has serious doubts about the whole hole-in-the-wall and SOLE philosophy too. She writes: “I have questions about community support. I have questions about what happens when we dismantle public institutions like schools — questions about social justice, questions about community, questions about care. I have questions about the promise of a liberation via a “child-driven education,” questions about this particular brand of neo-liberalism, techno-humanitarianism, and techno-individualism“. Tellingly she suggests that much of the ‘let-children-do-it-themselves-with-the-help-of-wonderful-devices ‘ philosophy comes from a libertarian silcone valley kind of way of looking at things (our shiny technology is the answer to everything!) – a proposition that, because of his emphasis on what poor kids can achieve, Sugata Mitra would most assuredly disavow. But still. Finally, ‘Torn Halves’ remarks that: One of the concepts conspicuously absent from Mitra’s critique of empire is that of community. He is all in favour of children working in groups to learn from each other, but he seems hostile to the idea of a community organising itself and organising the education of its children, and he goes on to question why Sugata Mitra didn’t go to the communities he touched first to ask them what THEY wanted and needed, rather than ‘imposing’ his experiments. 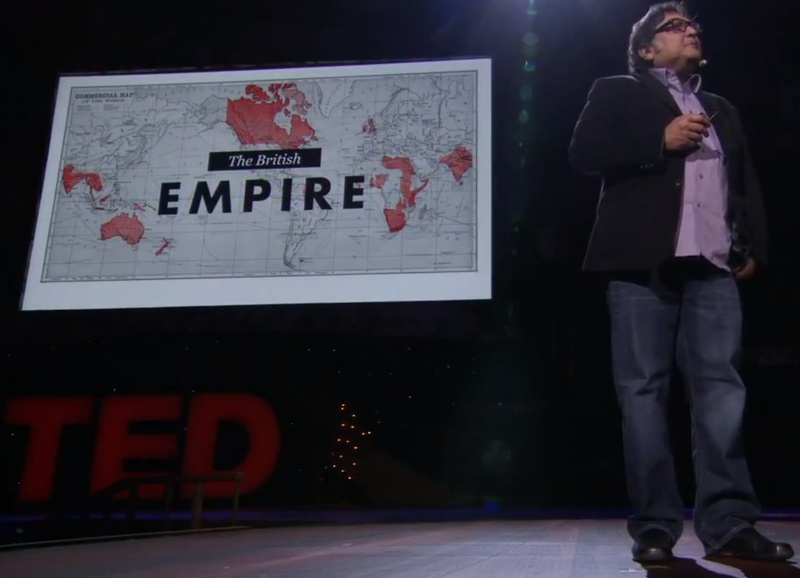 Was Mitra, in other words, guilty of the very colonialism that he starts his TED talk with? Gosh, all this hurts my brain! I’m captivated by the promise that Sugata Mitra seems to offer, but seriously alarmed (as always) by people who say we don’t need schools (because they have served humanity well when they have worked, it seems to me – though there is, of course, much that can be done better). I find the notion that all children will learn well with and from each other somewhat idealistic. And yet the idea that learning can come from a sense of wondrous enquiry is deeply attractive to me. On the other hand, it is telling that the one example that Sugata Mitra shows of a ‘granny’ helping in a SOLE has her (in the UK) drilling kids in India via Skype. Self-organised learning? I don’t think so. Old-fashioned stuff with a bit of technology thrown in. 1 Is technology starting to drive learning (cf what Pearson are doing – that was at the top of this blogpost), or is learning directing technological development? 2 Is ‘school’ outdated? or perhaps, what is the role of school in our modern world? 3 How much self-organised learning can (and indeed should) children be asked to do, and how confident are you of its success? 4 How on earth can we evaluate the glowing evangelism of a TED talk? ← Does reading (and learning a language) require two brains? But seriously, how do you feel about SOLEs? How convinced (or unconvinced) are you by the idea that kids can do it for themselves in a modern digitised world? People have been doing SOLES since before they could form words, Jeremy, just without computers. And I’m sure you’ll agree that a lot of that actually works. Can kids do it for themselves in a modern digitised world? They can surely do lots – they can learn all sorts of like skills: computing, accounting, cooking, car maintenance, philosophy – all sorts of things. All my modern knowledge of computers comes from computers and the people I have met through them. But really ‘kill’? I don’t think so. For a start the embedded systems of people sitting in rooms with teachers are not as frail as we fear. Nor does technology change come as quickly as some of us would like. There’s a long future of schools and printed books stretching out before us, of teachers, and chairs, and boards and all the rest. Nothing is being ‘killed’, nor will it, possibly ever. But when technology can provide me with a better learning experience than I can get locally, well then I’m inclined to think that there’s nothing much wrong with that. Of course it’s great to sit down with people and learn together (or ‘construct knowledge’ if you want to go all hippy on me), but if you can get it better elsewhere, what’s the problem? And if that leads to certain elements of the education system dying off… well, that’s evolution at its finest! Thanks for the mention, Jeremy. Gavin is right; the sort of activity that Mitra describes (getting children to work the answers out for themselves) is the sort of thing we were doing before anyone ever dreamed of packet-switching and the hyper-text transfer protocol. What is different now (apart from this insistence that the heart of every SOLE is a computer connected to the internet) is this new pedagogic imaginary according to which education is essentially invasive (and therefore something to be kept to a minimum). The idea seems to be that we need less education – less will be better – instead of thinking we need more, good education organised by well-trained professionals who have a sense of vocation (rather than just being well-intentioned pensioners with time on their hands). I have always disliked that ‘hey teacher, leave them kids alone’ lyric. There’s a reason why civilisation has always revered teachers (when they have), and why parents send their children to school. At their best, schools are wonderful challenging and exciting ecosystems where, if you like, . ‘Grannies’ may be able to replicate that, but I see no reason why I would prefer one of them to a highly-skilled, trained, reflective practitioner with a heart! Someone once said that all philosophy is just footnotes to Plato. I like your implication that Mitra is really only adding a footnote to Pink Floyd! Further thought: It definitely isn’t technology that is posing the threat to schools. As other people have said, the threat comes more from the forces that want more and more of public education moved over to the private sector and the rest trimmed back to whatever is considered to meet the needs of the economy. And what is disturbing when listening to Sir Ken Robinson, for instance, is how the ideas for reforming education always take off from some assessment of what the world of work now demands. Mitra does the same in his talk when he moves from critique of the past to vision of the future, and introduces the vision with a recognition of the demands of the workplace. In various ways, both Mitra and Robinson help to persuade us to trim back the ideals that we used to have regarding education (back in the old days when we used to discuss silly things like education for democracy, for instance), to make way for a more entrenched hegemony of the economy. I love the idea of technology standing in court…”technology, you are charged that on the third day…” etc. At the risk of repeating myself (in case people come to this blog who have not come across the Facebook discussion), the argument made by Sugata Mitra involves school obsolescence – the idea that schools are no longer needed. Hence my deliberate use of the word ‘kill’ in the title of this post. Watch the audience in that TED talks, and they buy the idea. Listen to Sugata Mitra (and other TED talkers) and their evangelising is high on emotion and somewhat shorter on real grit. Now don’t misunderstand me; I do not dismiss them (Mitra especially) out of hand. He is definitely on to something about the place of enquiry in education; about children working together to solve problems. Yes, we did this before the world went digital,but to some extenent (as you have said time and again in presentations) the digital world changes things somewhat. The question for us, listening to the ‘noise’ around Mitra, is whether there is anything ‘game-changing’ going on. For what it’s worth, my own take is that schools have been there for 100s of years for a reason; that Mitra is not really offering an alternative anyway; and that the digital reality we live in is rich and incredible. i think a lot of the debates arises due to the perception/reality that Mitra is generalising from what works in a certain context to the whole of education. it’s interesting to note that his paper that he credits as kickstarting minimally invasive education is titled “A computer assisted learning strategy for computer literacy programmes.” which seems very clear about the context and goals of learning. (http://www.ascilite.org.au/ajet/ajet21/mitra.html). the problem of few/or no teachers in parts of the world is serious, does Mitra’s approach help or hinder? thank you so much for coming along and commenting on this blog post – and thank you especially for the references. I have no difficulty at all with the idea that kids (SOME kids? Or ALL kids?) can gain basic computer literacy on their own. Many of us have done and/or are doing the same thing, using support network in ‘the cloud’ etc etc. I can see how brining such literacy to kids who do not have sophisticated private education (for example, or indeed any proper education is a laudable aim in many ways. What I am unclear about is how universally applicable such a thing might be. I am not persuaded that kids on their own, in SOLEs are better off than kids working together in groups that are provoked, guided, given feedback and organised by teachers. The one ‘granny’ session that Mitra showed in his TED talk was not encouraging! The fact is that in his talk he WAS talking about the ‘whole of education’, and that worries me considerably! It’s the evangelism that rankles a bit along with the wholesale gullibility. The future of education may well be at home from a computer but I don’t think we are yet there, not for quite a few decades anyway or even a lot more. It will take time, I think to wean the pupil away from the need of a teacher. Hello Maris, thanks for being ‘here’. Evangelism is always worrying, isn’t it! Or is that just my cold British cynicism at play? I think kids are amazingly luckier than we were because of all the resources they have at their disposal. But Nick Hockly is right, for example, when she insists that they need computer/internet literacy training. And that is best done by sympathetic trained reflective guides. That’s us! Thank you, Scott. Wow the fun they must have had!! Well as to that, I reject Sugata Mitra’s vision of education as some kind of colonial imperative. Did no one during the days of empire ever contemplate philosophy or immerse themselves in Shakespeare or come to appreciate great art? Or were they, as he suggests, all just clones of each other? I don’t think so. Here’s the thing: he’s inspirational when he allows us to think of brining more opportunity to education-deprived communities. But his characterisation of schools (great messy community places where the young gain knowledge and ability from and with their trained professional elders) as obsolete doesn’t do it for me. I like help and guidance through the jungle, else I’ll end up just like Piggy! I think you are absolutely right – that there is an alarming undertow of fear that somehow we (= teachers) are being stealthily replaced by the wired world. No longer the fount of all knowledge etc etc. Yet of course the best teachers throughout the ages have, in the words of Gibrahn’s prophet, always lead you ‘to the threshold of your own mind’. So you are of course (again) right that SOLes – a form of them – have always been there (minus the shiny stuff). But/and Mitra’s vision is hubristic, it seems to me. If he were to say ‘look how technology can enhance and expand the great community learning experience that a school can be’ I’d be right behind him, cheering on. And I would think of many people like yourselves (2nd mention for your work on digital literacy) whose role is to help, guide and yes, teach people with the accumulated humanism and experience they they/you/we? possess. Based on the evidence in front of me, that is not what Sugata Mitra is offering. Grannies, yes. And that’s all? But perhaps I AM just alarmed by the thought that whatever professional expertise and training I may have can be so lightly bypassed. I will gaze deeply into my soul to make sure that is not the main motivation for my disquiet!! Is technology killing school? No. It is transforming schools…where the word “transform” means…err…transform. Should schools be transformed? Um. Yes. The argument about the impact that digital technology is having on education tends to centre around whether or not it is needed or whether or not it can be used to enhance learning. “Don’t incorporate technology unless it is bringing some pretty impressive cards to the table,” we are told. “Technology for the sake of technology is bad,” we are warned. These are flawed arguments that see technology only as a tool for our cognition to use. Technology, I am rapidly becoming convinced, is our cognition. Or at least a sizeable part of it. In the same way that we wouldn’t lobotomise a distracted student (any more…damn you, Eurocrats!) or trepan a mildly melancholic pupil, we shouldn’t be laying down conditions for the use of technology. This might all be clearer in my head than in anyone else’s. The best advice I can give is to go and read about the concept of embodied cognition. Of course, those of you who wish to heed this advice are going to go and search for things on the internet – a digital technology that doesn’t just enhance our knowledge but, to a great degree, IS our knowledge. You won’t be put off by the fact that the knowledge is presented in a rather staid series of letters, words, clauses, sentences and paragraphs. Similarly, students don’t need whizzes and bangs to make technology attractive. They don’t even need it to be attractive. They just need it. Where most of Factory ELTs efforts are falling down, I think, is that the publishers are trying to shoehorn a tired…an exhausted…concept of cognition into an emerging one. The publishers still think that the computational metaphor of cognition (“The brain is a computer…it is the seat of all cognition…it can be developed by feeding in lots of input…”) is the right one. The concept of embodied cognition locates cognition outside of the brain in a social environment. The brain is a tool that we use but the brain uses the environment to store its knowledge. “Intelligence” (something that might be teachable) consists largely of learning the best ways to access the information that is around us. Anyone who thinks that this can be done these days without any recourse to technology is…well…is unlikely to be reading this. Now what about schools? What are schools? Increasingly they are becoming training camps for the future producers of the world. In the industrialised world, they also serve as holding pens for the dependents of the current producers and social induction camps for society’s newest creations. Should schools be transformed? Google “Does a bear move its bowels in the woods?” Or don’t. Your response to that question is going to depend upon your ideology. If, like me, you believe that education serves the purpose of helping people engage with their world by discovering things about it, you will probably agree with the idea that education needs to be transformed. If you think that education should serve the needs of the economy, then you may not think that it needs to be transformed. If you think that both goals are mutually compatible, you are either very rich or very powerful…in any event, very privileged. Sugata Mitra is a showman who is being feted by many who are not stopping to look at the facts that he is laying out before them. Why critically review a research paper when you can watch a funny, self-effacing and charming individual tell a story on YouTube? Herein lies technology’s achilles heel. Humans are susceptible to a ridiculously long list of cognitive biases and our cognition is so lazy and susceptible to erroneous logic that a few whistles and a few bells are enough to convince us that X is Y. We don’t want to dislike Sugata because he is delightful. We don’t want to disprove his message because it is endearing. We want to believe that we all have the potential to teach ourselves. We want to believe that there is hope for the slumdwellers and the poor of this world (not least because it means we don’t have to trouble our conscience). We don’t want to alienate ourselves from the great and the good who all tell us that Sugata is great and good. Thanks so much for coming along – and for your extremely thoughtful and well argued comments. There is so much in what you say that I agree with. There is something perverse (in my country – the UK) about the constant elision – in politics – of schools and future careers. There IS something in what Mitra says about schools-as-factories (though why on earth that is used in the context of British colonialism I don’t quite understand – that is, if education is a world phenomenon from earliest times`) And so it is very east to say ‘school’s obsolete’ and have happy clappers shriek with delight. But school is not dead. In the best schools the very spirit of enquiry that Sugata Mitra suggests is alive and well. The best teachers (hell look at the literature even in our world of ELT) have always promoted enquiry, investigation, critical thinking. That’s what they were doing 500 years ago. Where. otherwise. did all the scholars come from? How on earth did Copernicus and Galileo come to their startling conclusions. Did they, perhaps, never go to school and so were spared brain death? The new digital world (well not so new, now) is nothing special in a sense. It just allows that spirit of enquiry to be broadened, enhanced, and more enticing. But I do NOT want to abandon kids to their desert island fate; I want them to have the enormous privilege of caring trained professionals, lifelong learners themselves, who have trained and thought and experimented themselves and who – unless youth is the only arbiter of the future – have such a great deal to offer. These are all very interesting concepts, ideas, and arguments! However technology itself cannot be blamed, like language it is of human construct. Humans build tools as there tools get better so do there tools! It sounds ridiculous, however at any point human reflection, all be it maybe a student human using a technological device may reflect that we have gone to far, and the next technology will be a deconstruct technology! This is what we do! Interesting discussion though great read! One has to look at TED talks for what they are…a highly regarded platform for Evangelizing and idea. Why do people get excited for them? Inspired by them?? Because that’s what perpetuates their importance. To expect anything more than a dynamic presenter evangelizing his/her idea and inspiring thought would be silly. But the last part, inspiring thought, to me is the key to TED’s success. Much like the editorial column in the ancient art of newspapers, the goal of the editor in writing a column is to elicit a response…positive/negative it really doesn’t matter as long as it captures the readers attention the editor keeps his/her job. TED talks can captivate you or irritate you but most importantly they should inspire thought not lemming like behavior or we all end up over the edge of the cliff. thank you so much for reminding us of the whole point of talks – or evangelising in general! It is, as you say, to inspire us, to shake us up, to challenge us, and maybe even, yes, to entertain us! And guess what; TED talks work, else why would I be writing a blog about one at all?!! Been following this on Facebook and just read what people have been saying on your blog. I wasn’t going to comment but the subject got me thinking so I did a mini (very mini) survey in my house. I have two young children – one who is very academic and loves everything about school and the other who would rather chop his right arm off than go to school and tells me every day that whoever invented school needed their head testing! But surprisingly when I asked him in all seriousness if he would prefer not to be taught in school but in front of a computer screen, he said no! “you get more out of learning from a teacher at school.” “It’s better to learn in a school environment because you concentrate more.” “you collaborate with your classmates and the teacher.” (his words, not mine). Listening to him talking about his school (that he absolutely hates) in this way is kind of reassuring. Schools, whether we it like or not, have a very important role in our society and they’re about much more than just learning. By the way, neither one of my kids wants to be a singer or a footballer or a footballers’ wife when they grow up!! I am so pleased that you came along and made these comments. You ‘small survey’ is full of learner wisdom! What I hear clearly is why schools DO work (when they work!) and why the whole digital reality we live in is not some kind of alternative end-of-rainbow dream to be sought after. Teachers (well-trained, reflective teachers) have the ability to probe, offer incentive, guide, tease out solutions etc – or even (in a phrase I like from an article by Wong and Waring about correction in ELT Journal) ask ‘pursuit’ questions to make kids thing more and more. Perhaps that’s what Mitra’s grannies can do, but as I have said already i was disappointed that the only one we saw in action in his TED talk wasn’t doing anything as interesting as that. And yes, I like wise and compassionate grannies (or even grandfathers if it comes to that!! ), but I’d go for a wise, trained, compassionate teacher-grannie any time! I agree with Mitra that teachers who can be replaced by a machine should be. But I don’t agree we should get rid of human teachers. Technology enables us teachers to do what humans do best, without worrying about the repetitive part of teaching. We need schools and we need human teachers, but that doesn’t mean we don’t need technology. I actually don’t understand people that are against (or wary of) technology in education. Like Seymour Papert once said, teachers don’t go about discussing how to use a pencil or if the pencil is good or bad for education, although a pencil is a piece of technology. We should stop worrying about computers and focus on our students and what they need, and then decide the best way to meet those needs, which sometimes will involve the use of some technology. School as it is works for the average student, and it doesn’t usually allow for the individualization of learning. School usually teaches content instead of skills, which is a problem for children growing in an environment which is permeated by computers. Computers allow children (and adults) to have access to infinite content. Thus, we have to teach our students how to deal with and process that content. The idea of teaching learners how to process information instead of trying to teach the information itself is not new to language teachers. We know our language learners have to learn how to process an L2 by themselves if they are to become fluent in that language. I guess my point is, yes, we can have children learn without human teachers, or even without access to the Internet, and they do (their brains are made for learning in almost any condition). But the real question is, how can we best help any child to learn anything? I believe the answer is to give them both a computer and a well trained and educated human teacher. thanks for coming along and commenting. I share your view about technology in general. Perhaps then (because I also believe profoundly in the value of well trained and competent teachers) one of the teachers main jobs should be to help guide and show students how to best understand and use technology. Mitra suggests kids can do it all themselves (that’s the message of ‘hole in the wall’ as I see it), but the technological world is as much of a jungle out there as the real one is, and we tend not to just release children into jungles without some guidance or care. Is the same true of the digital world? I suppose (based on his TED talk) Sugata Mitra would say that grannies can do that. But then I wouldn’t want any old granny guiding ME through a jungle…. We are doing a very exciting project with Plan Ceibal in Uruguay – the first country in the world to give every child in state primary and secondary schools thoughout the country an OLPC laptop – where lessons are being taught remotely using telepresence technology by teachers located in Argentina, Colombia, Mexico and in urban locations in Uruguay itself. The children can access British Council LearnEnglish Kids materials and other materials specially created for Uruguay on their laptops, and their class teachers, who dont at present know much English are learning it alongside the children. So far the schools and teachers involved are highly motivated volunteers but the plan is to expand to eventually reach 90 % of primary schools with remote lessons. I agree with Adriana that ” the answer is to give them both a computer and a well trained and educated human teacher” – but the teacher doesnt have to be co-located with the students! thank you so much for coming along and making comments on this page. I am very well aware (of course) of what is happening in Uruguay; the last time I was there they were all getting very excited about your forthcoming visit! I have had great fun watching the ?latest Plan Ceibal video here http://www.youtube.com/watch?v=S-2lJdutHAw which shows remote teaching in Uruguayan classrooms (it’s easier – in case anyone wants to watch this – if you speak Spanish, but even without that it’s fairly clear what’s going on). I have been a huge fan of the whole one-laptop-per-child initiative in Uruguay, and indeed, I am most impressed by the work you have done there, and the ‘beaming-in’ solution to a perceived problem about/for primary teachers and students there. The teacher doesn’t have to be co-located with the students? At a workshop in Rotterdam yesterday with teacher trainers (and on this very subject) there was a strongly held view that was can happen and is possible in face to face interaction can never really be replicated remotely. I tend to sympathise with that view, though of course that may just be teacher paranoia etc!!. In the end the solution may be (and always should be?) the better preparation and training of teachers, real live ones, in the classroom. I think I would prefer them to ‘grannies’ (Mitra), robots (Korea), or beamed-in ones pretty much all the time. But that is not meant s a criticism of what is being done, currently, to ease difficult situations in circumstances such as the one(s) you describe……. I am so happy to read this post, as I watched Sugata Mitra’s TED Talk a couple weeks ago and my head was spinning afterwards. Like you, I also believe it’s a bit too idealistic to say that children can just organize around emerging technologies and with just a bit of coaching, learn what they really need to learn. To me, it’s not an issue of whether students (even young children) can be autonomous or motivated -it’s a question of having a curriculum, of scaffolding, of assessing the work of students and coaching them in the right direction when things aren’t working. Perhaps we don’t need to learn how to have beautiful handwriting or do arithmetic, but it seems extreme to me to say that we can just give a computer to a young child and let them figure out the path they’ll need to follow in order to learn the skills and knowledge they’ll need in college, if they choose to attend later. Would Sugata Mitra also advocate for an end of universities? In my opinion, Mitra’s message is powerful because it touches on the need for education to reflect technological advances and different world dynamics. People nowadays can work collaboratively with anyone in the world. Knowledge is being shared at an amazing speed and we as learners and educators need to know how to exploit this to our advantage. As much as I believe emerging technologies are extremely useful, we need to discern what is truthfully useful and what isn’t. Each community has it’s own needs and my distrust in Mitra’s proposals lies in the fact that he seems to have a ‘one-size fits all’ approach to education. sorry it’s taken me a bit of time to reply to your comments, but thanks for coming along. I agree with you that it’s the scaffolding (if that’s the term that fits) which can make learning successful, however learning takes place. I also think Mitra has a point when he sees technology a offering possibilities in places that ‘normal’ education does not reach. But, like you it seems, I have a distinctly uneasy feeling when people come up with a one-stop answer to things. Still worried about the grannies too! Thanks for this enthralling topic and sorry to be late on the post. I first watched Sugata Mitra’s talk on Edulearn11 few months ago, but it was good to take a look back at it on TED. Assuredly his clairvoyant research is commendable as he pictured the future of learning. But “ Is school [really] outdated and do we not need it anymore?” Although I believe E-learning will supersede schools in near future, I think we should not let it happen. What has baffled me so far is that if this is the case what is going to happen to motivation and encouragement? Can we really virtually get it? I do not think so. I mentioned that since becoming a student, I had never received great incentives. That is until the last year when my miraculous professor (whom I am sure you know mostly by his “Impromptutoring”) changed my perspective – in a positive manner of course. His heartening words have made me take a deep voyage to myself and pursue my interests by passing through the billows of the open-ended ocean of life. I doubt I could have ever been inspired in a virtual environment. In a part of his speech, Mr. Mitra said: “ Encouragement is the key” and also noted that “ the scores of those children raised from 30% to 50% just by being told that : `well done, how did you do that?’ ”. Even though it shows the great effect of encouragement, I presume it will be ephemeral as you do not have person-to-person contact with the teacher. The other point that he mentioned is the importance of creativity with which I completely agree. But is it going to be evoked in drilling?! In the other part he said “We do not need to know anything anymore, only to be able to work things out collaboratively, by ourselves and with ourselves” and he ends with this question “Is knowing obsolete?” In my humble opinion collaboration does make sense but if knowing is obsolete then who we are in the absence of computers? At last, as a supporter of SOLE I should say that it plays a vital role because it makes students challenge the processes of learning and as Daniel Coyle says in “Talent Code” in this case “because you practice deeper you will [learn] and remember more”. But I think SOLE will not be efficient solely. Teacher and learner should be juxtaposed to not only go for Edulearn but Eduworld! thanks for your comments – and sorry it has taken me a bit of time to reply. Actually, saying ‘well done’ a lot doesn’t seem to me to work that well. I much prefer his suggestion that asking ‘what are you doing? and ‘How are you doing that?’ makes more sense. Like you I utterly reject the idea that ‘knowing’ is obsolete. We cannot (and do not) run every aspect of our lives by googling it! I really enjoyed Sugata Mitra’s talk, yes it was funny and slightly idealistic, and of course it appeals to technologists, but I don’t think that’s a reason to dismiss him. I also don’t think that anybody who applauds him is “gullible”. The idea that school is a control mechanism is not a new one (Another Brick in the Wall). My comprehensive school was not full of Mr Chips/Mr Keating/Sidney Poitier type inspirational teachers, it was full of teachers teaching the curriculum and reading their magazines in class. Some children are privileged enough to receive an education at school that is empowering and uplifting, but many are not. I find the idea the internet might be able to offer greater access to knowledge and make education more egalitarian a very important message. Small, technology assisted group learning vs classes of 50+ students and an overworked teacher – no contest. I agree that grandma-assisted learning (GALL) is taking a bit far though. Thanks so much for coming along to comment, Oliver. And your memories of your comprehensive education fill me with sadness. I have met those teachers! So yes, I entirely understand why what Sugata Mitra has suggested is appealing. Of course I do. My understanding is tempered, however, by a concern that not all children fit the description of the students he eulogises (in a way) just as not all teachers fit the mould I would like to create for the profession! I have tried this in my class and surprisingly enough it works. My students come up with their own questions, research with each other, take care of glaring behavioural issues, present the information clearly and concisely and hold up well under the intense scrutiny of their peers towards their work. I have used it in different modified forms and got the same results. I am a believer. looks like I never replied to you comments. I am terrible sorry for my bad manners. I am thrilled that ‘it works’. The question that really interest me is what is your role in all this? for my thoughts on education. An interesting view of the TED talk that I watched a couple of times too. Is ‘school’ outdated? or perhaps, what is the role of school in our modern world? School is most certainly outdated and I believe it has been since before I entered the education system as a teacher. One of the most truly exciting things about technology has been the liberating experience as an educator, to finally leave the traditional bricks-and-mortar of schools and teach online. As a passionate educator, I am now free. Freed from the shackles of poor administrators, freed from the outrageous number of pointless meetings, freed from badly disciplined students over which I had limited control. As an educator, I can maximise my time teaching online. I bring my teaching to those who want it. I can take my skills across the world. What this means for eduction is that the best teaching will be available to those who have the Internet. What this means for motivated and organised educators is that we can now channel our energies is a much more efficient manner. Thanks to the Internet, I was able to set up an online English language school specifically marketed at Turks: http://www.turkslearnenglish.com . Young Learners love to be online. They gain confidence. Nothing motivates children more than using technology. The classroom is finally a controlled environment again where discipline is no longer an issue (You swear in my classroom? I expel you from the lesson in 0.25 of a second). And best of all, as an educator I am completely free of mind-numbing administration and administrators. The time I save is dedicated to making myself an even better educator. It’s a massive learning curve and it’s sure that I’m making mistakes along the way… but my students are engaged, I love my work again, and every week technology offers me a new way to present information. Whiteboard, blackboard, smartboard… whatever you want to call it, the physical version is going to disappear. The physical school will still remain for a long time, and rightly so, but school administrators are going to finally have to serve teachers again rather than act as the parent public relation department that they have become. The role of school is unknowable, but for certain we can say that it’s importance will dwindle. The good news is that the best educators won’t be based in a physical place. School will diminish in importance as the skills of an individual educator can be accessed by many, and not just by a few. It’s a exciting time to be in education. nearly a year ago and I never replied. How unpardonably rude of me. Please accept my apologies. I too teach online and I love it. But last July I taught the course that I teach online face to face. Which was better? Difficult to say. I think the students who had face to face classes with me had a different experience, is all. I certainly hugely enjoyed their physical presence and the interactions we all had and, at the moment, still think I prefer it. But of course we used technology too, both inside and outside the classroom. Here is my post on Mitra. thanks – and I over it! Great reading this Sunday with my coffee and sunshine! I won’t belabor and repeat a lot of the points made. I agree, the sky is not falling, teacher and “the relationship” between student and teacher is going to be here for awhile. Mitra isn’t an educator nor has spent any significant time in a classroom understanding group dynamics. His experiments are small scale and in a way but “thought experiments”. However, I do applaud one thing that has come from his talks/promotion – a realization that there is much benefit in the teacher leaving students alone to find out the answers for themselves. In my own few decades in the classroom, this is the most pressing need – to get teachers to get out of the way, lay off and let students have a go. If we teachers do that more, we’ll be more valuable than any bow tied hardware. However, seems the winds are currently blowing the other way these days of standardization and teaching by numbers, business driven ELT. I also personally abhorred Mitra’s statement a while back that we shouldn’t read bloggers, writers, tweets at all – only peer reviewed research can hold the truth of what we should do in our classes – as poppycock of the highest order. He’s an academic and a mathematician – a terrible combination for anyone driving educational policy. A few long and short answers to your questions. 2. Mitra also doesn’t address the underlying rationale and “need” for schools. Why do children spend so many years there. As DOS outlines, schools since the late 1800s and the institution of the Prussian model, became a means of both cultural transmission and child caregiving/warehousing. Children/students would grow up marching to the party/country line and also be cared for by the state so that parents could produce goods and create a workforce for the business class to prosper. Until we solve this vicious circle (1. children forced to attend school 2. Parents able to work and produce economic value 3. Companies/businesses hire only those who have “credentials” that validate compulsory schooling and create compliance 4. Children grow up, get jobs, have kids who are kept by school), until we break it, schools will continue to exists as they always have. 3. Depends on so much. Teaching isn’t one size fits all. It is an agreement among many stakeholders. I think with content based subjects SOLE works well but it depends on learner beliefs, teacher’s own beliefs and fit/skills, student levels/ages, institutional support, access to technology, educational objectives, social needs of students and so on …. for languages, I’m not convinced. Best model is a blended approach with technology complimenting what the class does face to face. 4. Old sufist saying, “the dog barks, the caravan passes”. This too will pass. Lastly, want to ask how and why these guys giving these plenaries get away with doing the same one over and over and over? The world has moved on from this model and too, isn’t it a bit brain numbing for the one giving the plenary? Or is this road too easy not to resist? Mitra has probably given this same plenary a good 100 times. The last time I heard it, I could see how tired even he was of it. so much to reply to!! But thanks for coming along. I do worry about the money side of things, too, but I am not qualified to claim, as some have done, an underlying financial motive for all this. I completely agree with Sugata Mitra about the ned to look again at curricula and exams. But he is, of course, not alone in saying that. Exam factories are no way to teach kids. But school DOES have a profoundly important function – perhaps just in teaching digital literacy if nothing else!!! In a modern world a blended approach is the only approach worth considering I think! Mitra’s talk at IATEFL seemed to generate quite a lot of flak! I think his general points about discovery learning, positive reinforcement , whether from a granny, the teacher or a teaching assistant who lacks content knowledge, are indisputable. The message I took away for our Plan Ceibal project in Uruguay was that we should worry a lot less about whether teachers are following very detailed lesson plans and make much better use of the laptops which every pupil has by encouraging them to discover things for themselves . And working together in groups – one laptop per child might be a disadvantage. One between three or four may be more productive! great to see you in Harrogate. I agree with his general points too. Of course I do. They have informed all the best teaching I have seen, and were around long before there was any hole in the wall! I do believe that what educators do (or should do) is far more nuanced than just positive encouragement and if it were my children I would far prefer someone who was trained and had thought about how to do it than someone who had not. The success of Plan Ceibal Ingles will never, I submit, be just about the available technology, but it will be about the quality of care and insight that is brought to the task by the classroom teacher and the remote teacher. Technology may be a part of a solution, but it will never be THE solution. The message about lesson plans is a very good one – but again that is a discussion that we have all been having long before technology of the kind you (and Mitra) are using was around. The age-old discussion about discovery learning vs instruction, vs transmission teaching and collaborative learning, etc etc is pertinent and ongoing. My own (rather ill-informed?) feeling is that using technology ?merely brings these questions into sharper focus. But, like you, I am very taken with the question of whether OLPC may, in a classroom setting, be better reconfigured as OLPG!! Research needed!! Longing to hear more about how things are going in Uruguay. Kicking myself for missing the Harrogate update! In this video, Dr Bjork clearly states how technology is shaping the way people will learn in the future. Stepehn Krashen and Linguist Steven Kaufmann talking about How language learning has increasingly become an autonomous practice online and how people around the world are finding their own ways to hack their way to any language. Here you have the case of a little pakistani girl who manage to pass with high scores Physics at university level on her own using an online course at Udacity. Video Included. Education and Learning opportunities are not an exclusive good of institution and organizations. They are just a means to an end but with the over-flowing quantity of people wanting to learn, Schools and universities are now clearly showing their limits. And this is where MOOCS (Massive Open Online Coursers) like Coursera, Edx, Udacity, MIT opencourseware offer a sustantious and exciting opportunity. thank you so much for sharing all these videos etc. I do not disbelieve any of the claims made for the way the world is changing thanks to technology. It is worth remembering that MOOCS are not as successful or as game-changing as everyone claimed they would be. The extraordinarily high drop-out rate (incompletion rate) of many of these courses has led many universities, for example, to reconsider their desirability. They work for some people, but to for all. In the same way I would say that autonomous learning is incredibly successful for some, but not all. Furthermore there is huge benefits to be had by the presence of good educators in a face to face setting. Here Sir Ken Robinson talks about how educational systems need to change and evolve to current social changes in children and how to make education more appealing. BY THE WAY, THIS IS NOT HIS TED TALK!! Here a 15 year old kid researched and helped create a pancreatic test that is a lot cheaper and more effective. How did he do it? On his own with a computer, self-directed style! but that is my point. If every kid could research a cure for pancreatic cancer on their own then there would be no need for teachers or schools anymore. But not every kids can or does do this kind of thing. And would you like kids to be marooned in front of laptops and tablets? My own preference is for a judicious blend of enquiry (using available resources) and instruction. That includes, of course, the use of digital technology but does not exclude everything else. I use Mitra’s SOLE in my class every day. Is it the be all and end all? No. But it is certainly a step in the right direction. What it does is allow students to become more involved in their learning. When they get to choose topics and follow their ideas they are learning that what they think is important. From my point of view students need to develop more social conscious projects to research and follow through on. Teachers will always be needed, regardless of what Mitra says. Teachers help to develop direction and maintain focus so that ideas are followed rather than set aside at the next speed bump. I believe that children need to follow their interests. If they are interested in building things then we need to allow them to learn about this so they can be better informed about it. It is through experience, rather than study, where true learning lies. thanks for your comments which i find inspiring. I entirely accept the value of enquiry-based learning of the kind you describe and of course, some of that is mediated by digital technology, though not all. You are 100% right that the teacher has different roles in such activity, and not just the encouragement that he sometimes mentions – though the SOLE toolkit is better I think, than some of his plenary pronouncements. But teachers have a role in helping students acquire digital literacy – for example do we want to allow students to discover the bad consequences of putting compromising pictures of each other on Facebook or is it better to instruct them about this? My point? Instruction works some of the time. SOLE-type activity some of the rest of the time. I think that one of the things that is truly missing in school is the warm and caring relationship between student and teacher. I talk to all my students everyday about issues they face and things I see. I make every effort not to insult their intelligence while at the same time being very straight forward with them. I also will take criticism from them if given in an appropriate manner, which I always demonstrate. They know they can talk to me about almost anything and I make every effort to listen and question them so they can make the final decisions. This creates a trust that is necessary to learn. A teachers job is to guide the students through the mess they face everyday as they try to decipher and follow what they like. I have had many discussions about texting, instagram, and the dangers of the internet itself. In some houses I do not see this happening and feel that it needs to be talked about. We have discussed some topics that many feel should not be discussed. I do this because they trust my insights. Teachers will never be redundant. They are too valuable to be replaced by someone far away.